The Customer and Product query tools let you easily create your own custom reports in Ascend to fit your needs. You access them by clicking the Reports icon on the Ascend desktop. Then click the icon near the top to open the query screen you want. There are some slight differences between the customer and product query screens, but for the most part, your options are the same. using the dropdown menu. The report type options vary based on if you're creating a Customer or Product Query. et a date range or check the box for All Dates instead. Decide how your results should appear using Order By. nder Return Set, All is selected by default - but you can change that to Top by Number or Top by Percent to see specific results. 7. Use the filers on the right side to narrow down your results even more. For example, check the box for Category to see all the categories in the shop in the next column. Now check the box for Bikes. 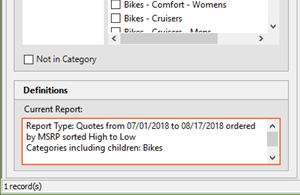 When you select a Category, any lower-level child categories for the Category are included in your report as well. 8. If you filter by category or vendor, you can also check the box for Not in Category or Not in Vendor. Sherpa tip: If you select Vendor filters, keep in mind that once an item is received, Ascend cannot tell which vendor the product came from. 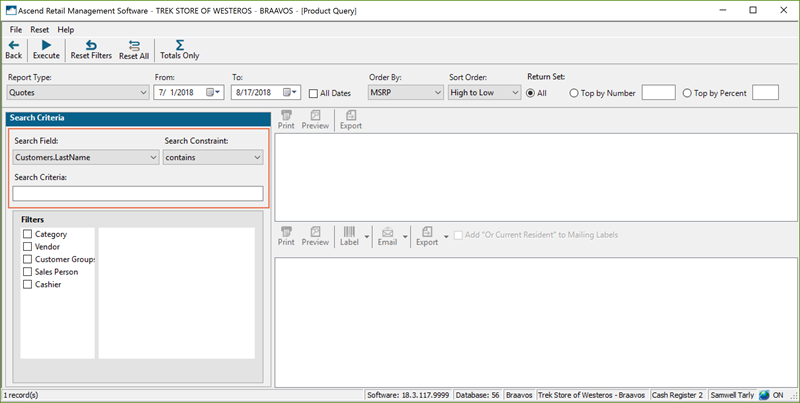 Products will display for every vendor you could possibly receive the product from - so if it isn’t a proprietary item, you could get duplicated quantities for each result. lower left field, where you can see an auto-generated summary of the report being generated. 10. If needed, select the Totals Only icon. This is a great tool to see total sales, COGS, Discounts, etc. over a period of time for all your products, specific categories, Work Orders, and so on. After you run your report, you can do a lot with the results. Highlight a product or customer in the middle of the screen to see specific information about them on the bottom. 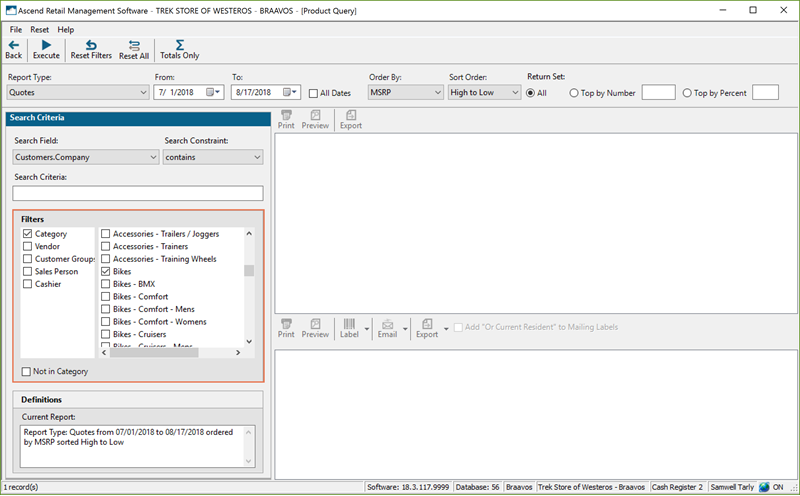 For example, a highlighted customer might show any sales items sold to that customer in your date range. 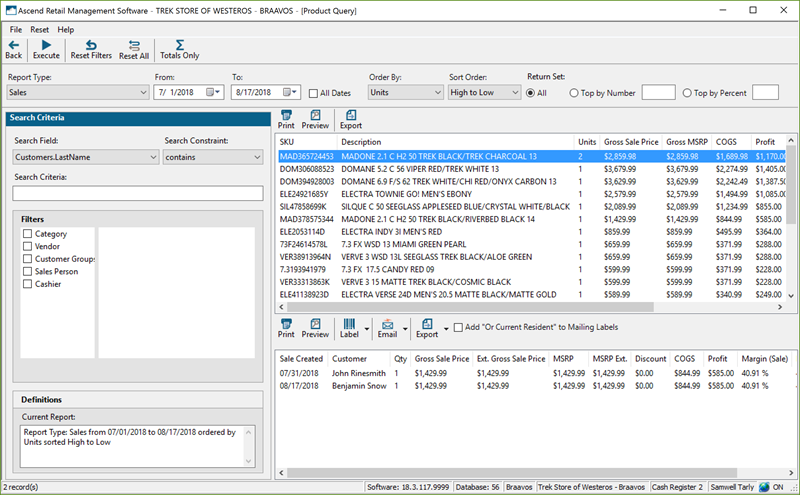 In this image, a highlighted product in the top shows us when it was sold in our date range and included transaction information such as which customer bought it. You can print, email, or export these results as needed - the icons in the middle apply to the that table of data, while the icons in the lower part of the screen apple to those results. Or print Mailing Labels for the customers using the Label icon. But you might want to check the box for Add “Or Current Resident” to Mailing Labels first.